City of Dream Nobu Hotel Room and Breakfast Package - Hello! Welcome to my blog! 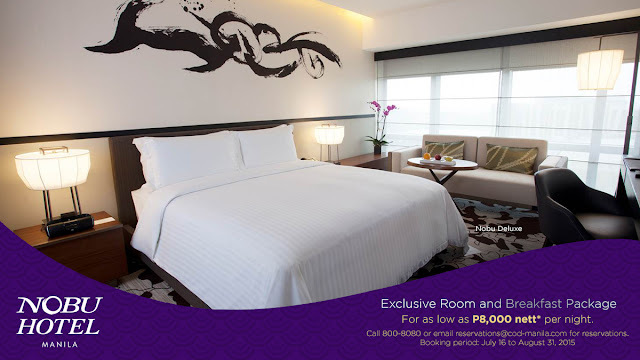 City of Dream Manila City of Dreams Nobu City of Dreams Nobu Hotel Nobu Hotel Rates Nobu Hotel Room Nobu Tel Numbers. Spoil yourself with a luxury-lifestyle experience at Nobu Hotel Manila's world renowned celebrity-inspired sophisticated style, bespoke luxury hospitality and outstanding Nobu-inspired cuisine. Take advantage of Nobu Hotel Manila's exclusive room and breakfast package with rates starting at P8,000 nett* per night when you book from July 16 to August 31, 2015. Package is valid for local residents only. See promo details here. For reservations, dial (02) 800-8080 or e-mail reservations@cod-manila.com. 1. Package is valid for local residents only. Guests must present proof of local residence (government issued ID’s such as DL or ACR). 2. Package is available for bookings made via hotline (800-8080) or e-mail (reservations@cod-manila.com). 3. Booking period is from July 16, 2015 to August 31, 2015 for stays from July 16, 2015 to September 2, 2015. 4. Rates are applicable for an overnight stay for two (2) adults and two (2) children. 5. Rates are inclusive of taxes and service charge. 6. Rooms are inclusive of free breakfast at Nobu Restaurant for two (2) adults and two (2) children. 7. Room rate may vary for each date of stay and for each room type. 8. Offer is subject to availability. Prior reservation is required. 9. Child or third adult aged 12 years and above subject to extra person rate of P1,500++ or P1,841.25nett per person per night inclusive of Nobu breakfast. Breakfast for children aged 5 years 11 months and below will be free should rate plan include breakfast. Breakfast for children aged 6 years to 12 years 11 months will be charged at 50% discount off breakfast rate of the restaurant. Breakfast for children aged 13 years and above will be charged full breakfast rate of the restaurant. However, if the family is paying extra person rate for the child aged 13 and above, breakfast is included in the extra person rate.